The actors behind Bob’s Burgers voices have quite a few things in common with their animated characters, as well as fascinating backgrounds that inform their Bob's Burgers characters. Dan Mintz’s voice will be recognized as Tina Belcher for a long time to come, groan and all. Like H. Jon Benjamin, who voices Bob, Kristen Schaal and Eugene Mirman are unmistakably Louise and Gene. John Roberts will always be Linda no matter where else his career takes him. The chameleons of the cast are David Herman (Mr. Frond), Andy Kindler (Mort), Kevin Kline (Mr. Fischoeder), Larry Murphy (Teddy), and Jay Johnston (Jimmy Pesto). Creator Loren Bouchard took his time finding the right Bob’s Burgers voice actors, while H. Jon Benjamin made sure he didn’t have to do much work and doesn’t read the scripts before the recording sessions, which in an unusual movie for an animated service, are done in one big group. Other Bob’s Burgers voices can be heard on Futurama, The Simpsons, Family Guy, as well as some of your favorite live action films and TV shows. The Silverman sisters play the weirdo Pesto twins Ollie and Andy. David Herman, for example, played Michael Bolton in Office Space. And if you’re an Adult Swim devotee, you’ve heard Larry Murphy’s voice work on Assy McGee. Learn some new fun facts about the Bob’s Burgers voice actors and vote up the trivia bits that delight you as much as alley raccoons delight Linda. Speaking of which, check out Linda's most Linda moments, and when you're done with that, take a look at our list of the best burger puns on Bob's Burgers! When creator Loren Bouchard asked Mintz to come up with a noise for Tina to make when she’s nervous, he simply used the one he actually makes in real life. “I remember Loren asking me to make a nervous sound for an episode and I guess that's what I did. Don't remember why I thought of that one in particular, but now I do it all the time when I'm nervous without realizing it,” Mintz explains. Apparently strange runs in the Silverman family. Sisters Sarah and Laura Silverman are perfect as the two trusting offbeat twins who always end up on the business end of Louise’s pranks. 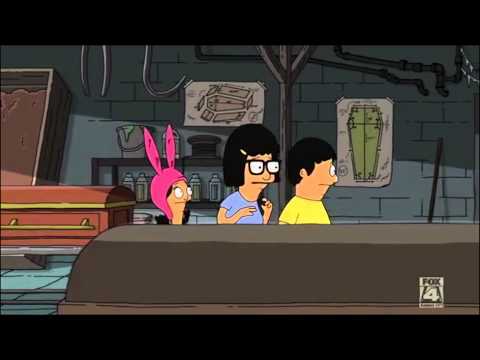 Most animated shows and films record each actor's line one at a time, but Bob's Burgers has them act as an ensemble. Benjamin explains the difference between the voice sessions on Archer and Bob’s Burgers. “Well they record the actors very differently. Archer records their actors individually, so we never work together. Coolest thing ever? Watching the cast read through a Thanksgiving episode script live in front of an audience.